My customary practice of seeing a movie whenever I go to Nanganallur, took me to Ajith's new flick Paramasivan. This is a much awaited movie for Ajith as last few films didn't do well at the box office for him. I am not sure if this movie would do any better either. One gets to see a new Ajith in this movie. He has lost lot of weight and appears slim and well suited for the role of an assassin. However, what hasn't changed are his monotonous dialogue delivery and comic dance movements. Paramasivan has patriotic theme and the oft repeated Pakistan bashing. Its about a honest police officer (Prakash Raj) going after the perpetrators of terrorist bombings in Kovai in the most unusual way. 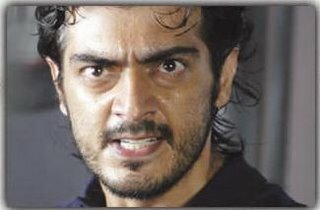 He recruits a death row inmate (Ajith) to eliminate the perpetrators while having a secret plan of his own to eliminate his recruit after the job. This simple story line has been complicated by introducing all the regular masala ingredients that have become a must for a Tamil Movie. The director, P. Vasu has also scripted the story line and the dialogues. He has done a fairly decent job with the story, but failed to keep it simpler and focused. There is a unnecessary comedy track with Vivek and a CBI track with Jayaram. Also, this movie would have been lot more tighter and simpler without a female lead. Laila's character doesn't jell with the movie and seem to have been introduced just to have some dance sequence. If Laila was unnecessary, Ragasia dance sequence in the jail was a total waste. At its best, it was a distraction and slowed the movie down. The only redeeming feature of the movie is Prakash Raj. He is the second hero of the movie and does a great job of carrying the movie on his shoulders. Yeah even I saw the movie..It was a really bad experience.Vasu should stop taking movie like this.The story is interrupted by bad songs and the fil itself is in bits and pieces without any connection. The film is not worth the money we pay to see it. More than Vasu, I am sorry for Ajith.. He needed a hit..
Any news about Athi? Couldnt find any..! Yes.. this movie could have very well be made with Prakash Raj as the main hero.. In fact, it would have been better that way.. I like Ajith. Sad to see that this movie might fail too.!! He badly needs a hit just like Maddy.! Yes, Ajith needs a hit very badly and he might have one with ParamaSivan.. I read in The Hindu today that ParamaSivan is considered a box office hit based on the first week collection.. This augurs well for Ajith.. He does look trim and fit in his new avtar.. I would have agreed about Ajith's makeover before I saw him in person at a restaurant called Miami on Thiruvanmayur beach. He has a huge paunch and his face has bloated up. And, right before him was a kingfisher beer which explained all that. If you get a chance watch Kanda Naal Mudhal and do remember to watch American History X. I could loan it to you if you like. Yes I will remember American Histroy X.. So, Ajith has put back what he shed.. sorry to hear that.. He is a decent actor but will be one of those guys who will not make past that invisible line.. Ajith & Vijay were considered equal few years back.. but Vijay has done well in the past movies and has moved far beyond Ajith..